Draw & Code were amongst the handful of developers invited to create launch titles for the Merge Cube – an exciting new take on augmented reality games. Having originally encountered the team behind Merge at Silicon Valley’s AWE (Augmented World Expo) Draw & Code were commissioned to produce two launch titles for this deceptively simple piece of hardware. The Merge Cube acts as both a display surface and a controller that sits in the palm of your hands and the brief was to produce games that were instantly playable but exploited this new medium for the video game. After experimenting with the platform and exploring several game concepts, the team settled on two puzzle-based games with roots in familiar gaming mechanics. Snake Attack sees the classic mobile game Snake reinvented for the six-sided Merge Cube. 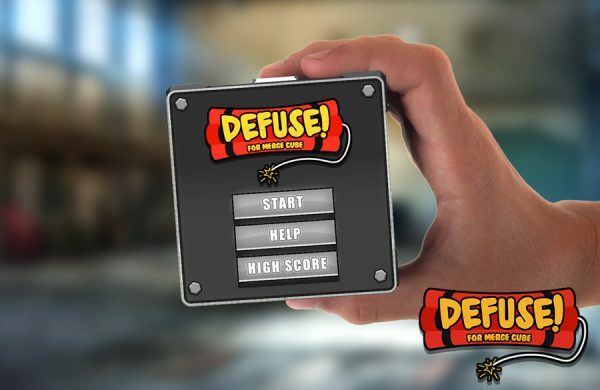 The second title, Defused, puts a ticking time-bomb into the hands of the player who has to navigate around the object solving micro-puzzles to buy more time. Both games would be relatively simple to produce using conventional control methods, but extensive research and play-testing was required to make the most of the Cube’s properties. Using a combination of Unity and Merge’s own SDK, the developers relished working on such an inventive new mobile game platform. The Merge Cube is now on sale in Walmart stores with both Snake Attack and Defused in the Merge Miniverse online store where they are free to download. Look out for more Merge Cube titles coming from Draw & Code soon!